RescueTime is a background app that monitors your time spent in a current application, window or tab. 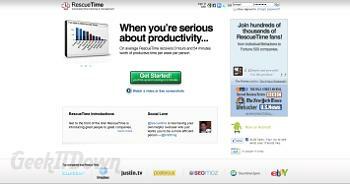 RescueTime service helps users manage their time and focus their attention. By using reports and blocking tools, RescueTime can help direct your time more precisely for increased productivity. Distractions are commonplace when working on the computer. RescueTime’s blocking tools can restrict access to websites for a set duration, enabling users to stay focused and productive even if they’re sent distracting emails, texts or other focus breaking item. The website blockage comes from a managed list of websites which users provide to the RescueTime tool and as such can be edited at any time. RescueTime also provides reporting data to manage where and how time was spent. Reports can be broken down by date, week, month, year, work week, weekend or even after lunch hours. The reports provide several graphs which document websites, documents, etc. that a user has interacted with over the specified period of time. The time-sheet type view breaks down items into categories and assigns each a productivity level which can be adjusted by the user if the automatically assigned ones are inaccurate. RescueTime productivity reports are based on everything a user does, but are not set in stone. Users can manipulate time spent on items to adjust them for removal or alteration as needed. RescueTime is a great way to see where time is spent and how much focus is placed on specific tasks. If you’re looking to improve productivity or just get more done in a day, check out RescueTime.